Adam Kruse (The Blind Education and Rehabilitation Development Organization - BERDO): Adam developed his passion for community organizing and advocacy while serving in Argentina as a Rotary International Exchange Student from 2006-07. Adam worked on a project building a local school and water system in the impoverished interior of Formosa. This experience led him to pursue a B.A in Anthropology from Luther College, where he focused on cultural and theoretical anthropological perspectives as well as social and cultural change. Adam also worked as a caseworker for Lutheran Refugee Services helping Somali and Hmong refugees to develop sustainable business models. 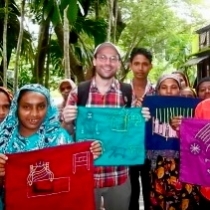 After his fellowship Adam wrote: "What I did in Bangladesh was less about the work I did with the organization and more about the relationships I was able to develop with individuals. I connected people who wouldn’t have otherwise been connected, and raised awareness of the issues faced in Bangladesh. The most radical changed thing of all is probably my view of the world and the new ways I’ve learned to interact with it." I’ve been thinking about the ways in which Bangladesh has been working toward women’s rights. In the past weeks I have been planning and getting ready to head to Barisal. When I think about the blind I immediately think of a good friend of mine.